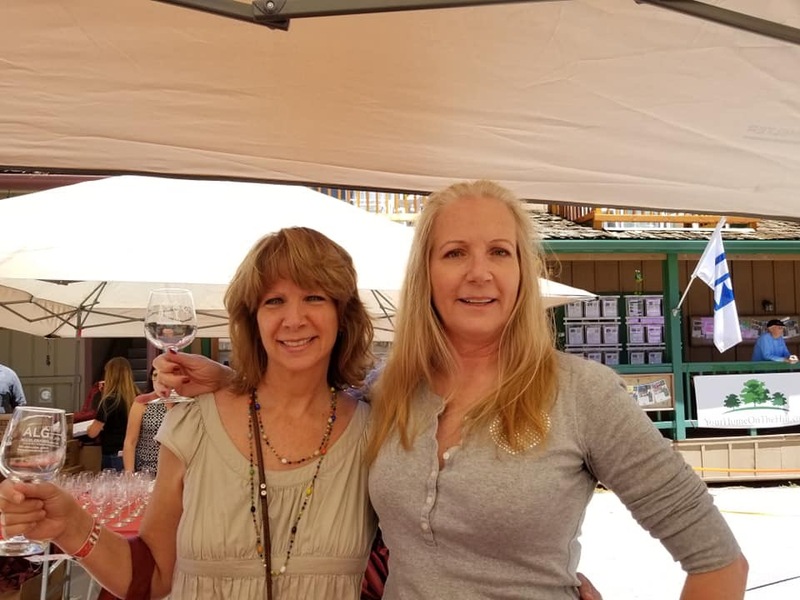 How Was Wine in the Pines 2018? Let Me Tell You! During the drive along an empty 5 freeway on a Saturday afternoon, up to the Frazier Park exit and then a few more miles to watch the terrain change from dry desert like conditions to lush green hills and pine trees, I got to try out all the great cornering my little Mini Cooper can make on the now winding road: Welcome to Wine in the Pines 2018 in the Pine Mountain Club slice of the Los Padres National Forest. I think this is the third year my husband has graciously given his ticket up to my baby sister “Charlotte” for sisterly bonding time. We’ve always taken full advantage of the hour drive up and back to get very caught up. 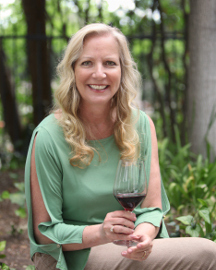 This year she said it was the best year ever as she was getting a hang of this wine tasting thing…while I visited with friends and tasted just a bit – lots of tossing out – as I’m the designated driver on these trips. Always a good time tasting and visiting with Arndt Cellars, Ascension Cellars, Cass Winery (Ted Plemons is always a favorite at this event, as are his namesake “Ted” wines), Charles Wine (no not a distributor, he makes these wines), Stephen Hemmert Wines (loved that Roussanne), the owners of Vinemark Cellars, Tobin James poured by two sweet wine lovers from Bakersfield, Hoi Polloi and Pagter Brothers (these latter two share the Double Trouble Wine Room in downtown Newhall) towards the front of the event. We always end our tasting in that section with my friend Yoshi Murakami with JFC International for chilled sake, shochu (he served one aged in spent Jim Beam barrels – my favorite) and shochu-based cocktails! The first year Yoshi poured at the event many people had only experienced warm sake, now that they’ve discovered cold sake, and how refreshing it is on a sunny day in the pines, his table has grown in popularity! As I made my way up the loop – I knew that organizers Mark and Debbie Bailey always try to put the same winemakers in the same spots so their fans can find them – I knew I would meet up with Sherrijon Gaspard with her refreshing Vina Sympatica sparklers (look for a new line of still wines coming soon) and I never miss time with Michel Ayer of Workman Ayer (my all-time favorite white and red blends). In the Pine Mountain Club Village Gazebo’s version of the Lompoc Wine Ghetto we enjoyed the live music, watching people dance and wine tastes from Flying Goat (Bubbles and Rose Bubbles), Fiddlehead Cellars, La Montagne (a new Pinot Noir) and Turiya. Then after rounding the back bend I expectantly looked for Lee and Helen Williams of Golden Star Vineyards in their bright tie-dyed shirts, an ode to their flagship wine “Purple Haze” making new wine friends, and greeting us old wine friends too. We loved the food that was supplied from the local restaurants like La Lena Mexican Restaurant, as well as yummy plates from our very own Wolf Creek Restaurant and Brewery. Would’ve enjoyed the Stella Artois Blood Orange beer our friends had, but I had to skip it, was getting time to get back on my favorite road! Proceeds from Wine in the Pines benefit the American Cancer Society. Find Wine in the Pines on Facebook too. Photo from Epoch Facebook page. One of the benefits of living in Southern California, as do most of our Eve Wine 101 readers, is proximity to various wine regions. Santa Barbara wine country is just a couple of hours away, Paso Robles a little farther and a few more hours gets you to Napa, Sonoma and beyond. Inevitably, once you do start visiting wineries, you’ll be presented with opportunities to join winery clubs. With so many wineries offering great wines, it is easy to get overwhelmed. How do you decide which clubs to join? For us, it is often, in addition to the wine quality, it is the feeling that we have a personal relationship with the people involved. Epoch Estate Wines in Paso Robles is a great case in point. 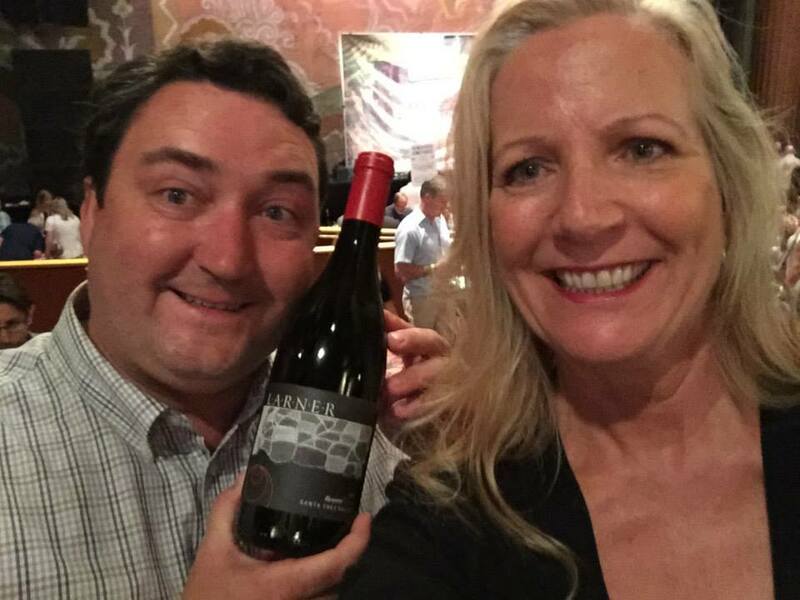 Karen and I first tasted the Epoch wines in 2010 when they were still being made at Denner. 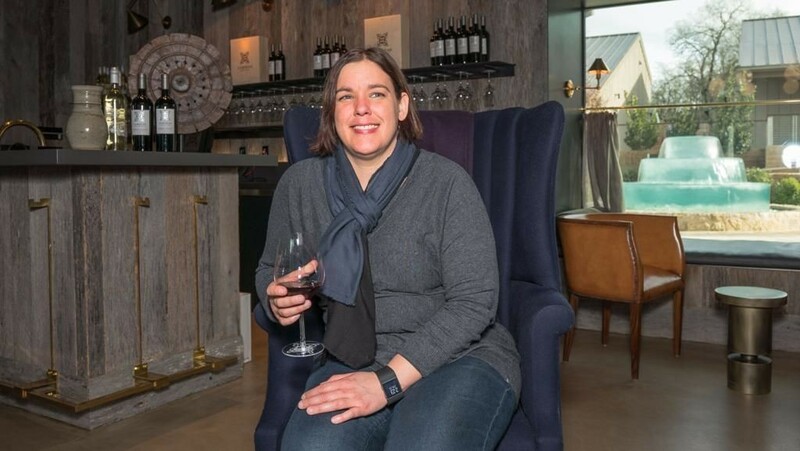 We had the good fortune to meet Kristen Darnell (née Carrillo), now Epoch’s Vice President of Sales and Personnel as well as newly hired winemaker Jordan Fiorentini. 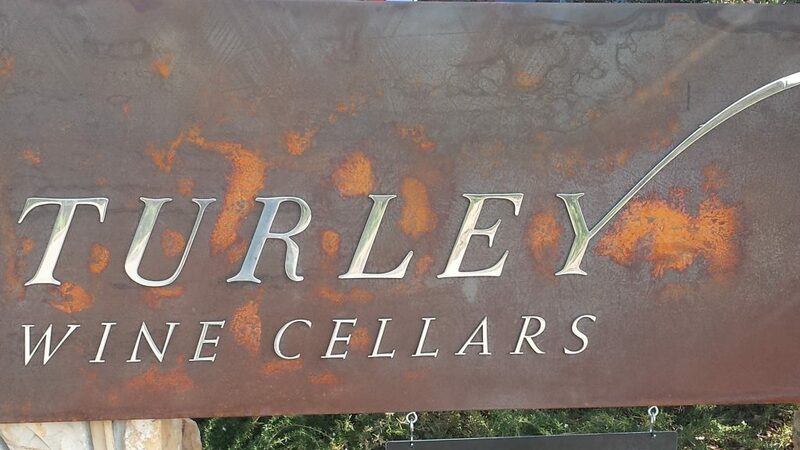 The wines were great, Kristen and Jordan were too, and the fact that the owners had purchased the old York Mountain Winery site to develop their winery [a place we had first visited in the 1980s] was icing on the cake. We were hooked. 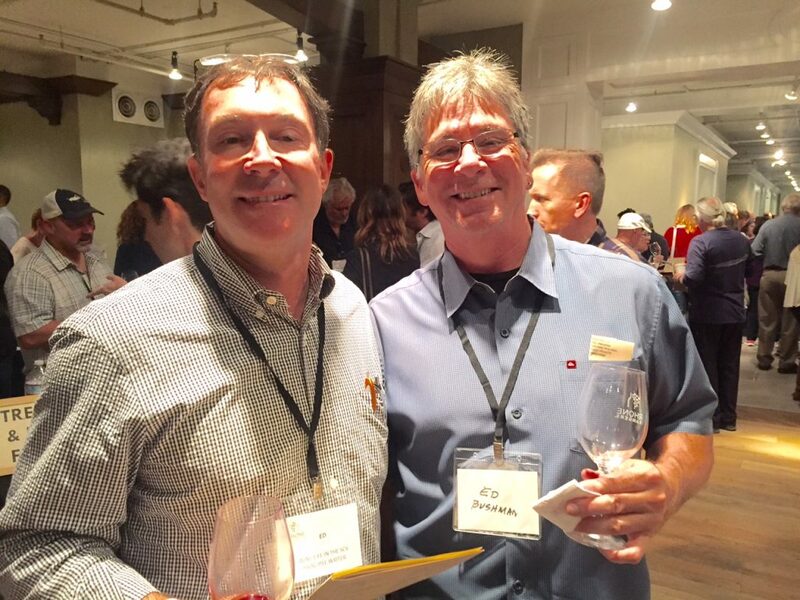 A perk of being in a wine club is that members often get invited to special events. 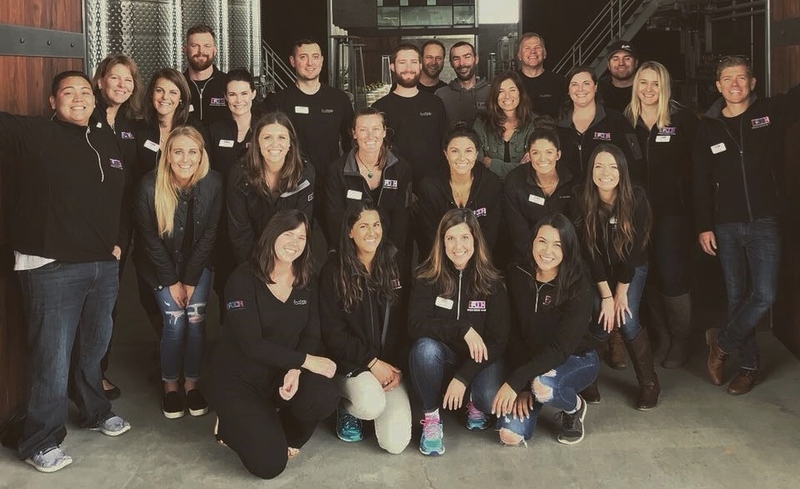 Recently, Epoch members were invited to the beautiful state of the art winery on York Mountain to attend not one but two events. The first event, reserved for the top tier of Epoch members, started with a reception that included passed appetizers along with Epoch’s newly released white blend [Viognier, Grenache Blanc and Roussanne] and Rose [Mourvedre, Grenache and Syrah] wines. Both were excellent but the Rose is really something special. Just ask my wife Karen. 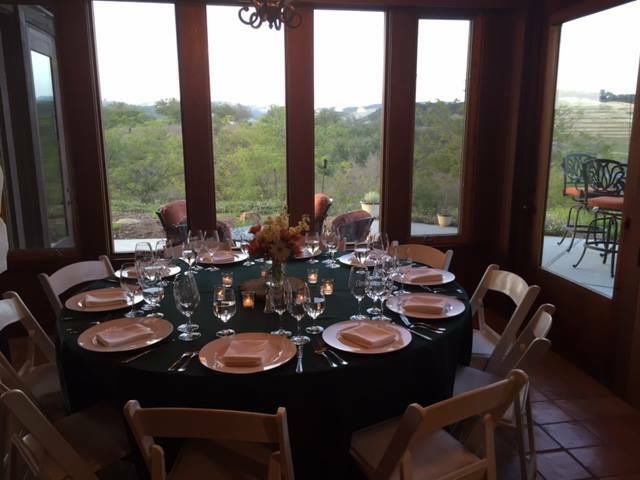 Then, we were treated to an elegant sit-down dinner in the winery, paired with the great Epoch wines. 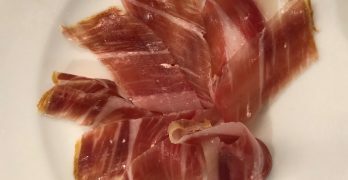 The 2015 Sensibility [Grenache and Syrah] was paired with Manchego & Prosciutto. The 2015 Zinfandel [with a touch of Grenache] was matched with Grilled Quail and the 2015 Veracity [Grenache, Mourvedre and Syrah] with Wild Mushroom Risotto. Finally, the 2015 Estate Blend of Syrah, Mourvedre, Grenache, Tempranillo and Zinfandel was served with barbecued New York Strip with bone marrow butter and Roquefort whipped potatoes. The dessert table filled with petit fours and brownies topped off the evening, along with more wine to accompany them. 2015 Sensibility with two flatbreads – one wild mushroom and the other prosciutto and arugula. 2015 Zinfandel with bacon wrapped blue cheese stuffed dates. 2015 Veracity with Capicola and blue cheese skewers. 2015 Estate Blend with lamb sliders. There was also Seafood and Chorizo Paella, which Karen really enjoyed with the Rose. Although the events were markedly different from each other, they both really emphasized one thing to me. While the wines are delicious on their own, they really shine when they are paired expertly with the right dishes. The other thing that always has struck me about Epoch is the amazingly nice people that work for them. Owners Bill and Liz Armstrong told me that this is the first requirement in their hiring process as almost anything else can be taught. Kudos on a job well done. It’s hard to believe that I’ve been writing about Guillaume Fabre, winemaker/owner of Clos Solene for almost nine years. Yet, he and his winery haven’t been the focal point of the article until now. My understanding is that this was the first wine released under the Clos Solene label. Guillaume had not yet made the full-time leap to his own winery, but was still working as assistant winemaker at L’Aventure in Paso Robles. Leaving his native France where he had grown up growing grapes and making wine with his family, Guillaume had come to Paso Robles to work with L’Aventure as an intern and fell in love with the Paso Robles area. Guillaume describes this as “un coup de foudre” – a bolt of lightning moment when he realized what the future in Paso Robles could be. This was the second such moment in his life, the first being when he met his future wife Solene, whom he convinced to join him in the New World. My next article about Clos Solene was nearly five years later, in 2014, as part of a longer article about up-and-coming Paso wineries. My big takeaway about his wine was “in addition to the purity of the fruit being expressed, these wines were incredibly elegant.” At this point, Guillaume had just left the relative security of L’Aventure and was devoting himself full-time to Clos Solene, pouring at the collective tasting room in downtown Paso Robles known as Paso Underground. Since that last visit, Guillaume has moved Clos Solene –twice! Paso Underground is still there, of course, and definitely worth your time visiting, with four wineries pouring their wares along with all the other tasting rooms in downtown Paso Robles. But just a few miles south of downtown Paso is an area known as Tin City, with an ever-growing number of small wineries. Tin City is well on its way to becoming a day’s destination all on its own. And as Clos Solene’s popularity and production increased, having a private tasting room / winery made sense. 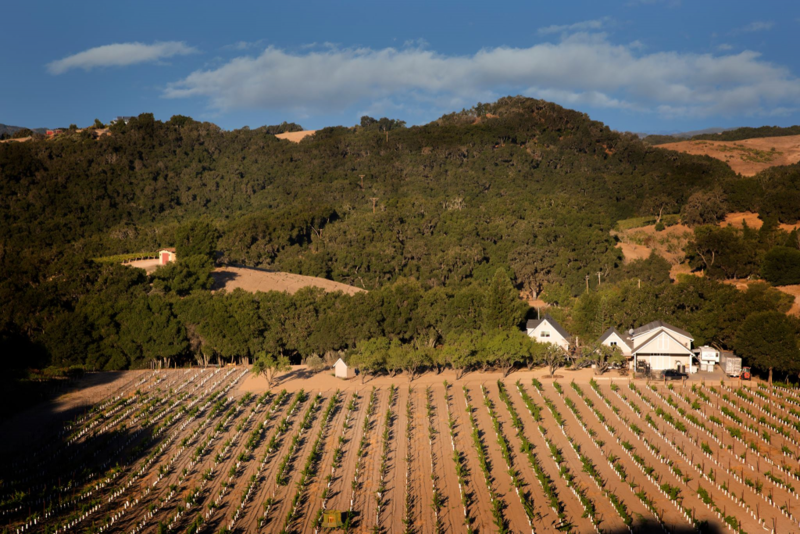 By the time we planned to visit him there, he had acquired the old Pipestone Vineyards property on Paso’s west side and was deep in the process of making changes to meet his vision of what Clos Solene needed to be. So we never did see him during that trip. Although we did see Guillaume and taste the Clos Solene wines at a handful of events over the years, it took us another year [and about four years since our Paso Underground visit] to make the drive on a rainy Saturday morning into the hills and follow the long driveway to visit the property that Guillaume and Solene had acquired about a year before. 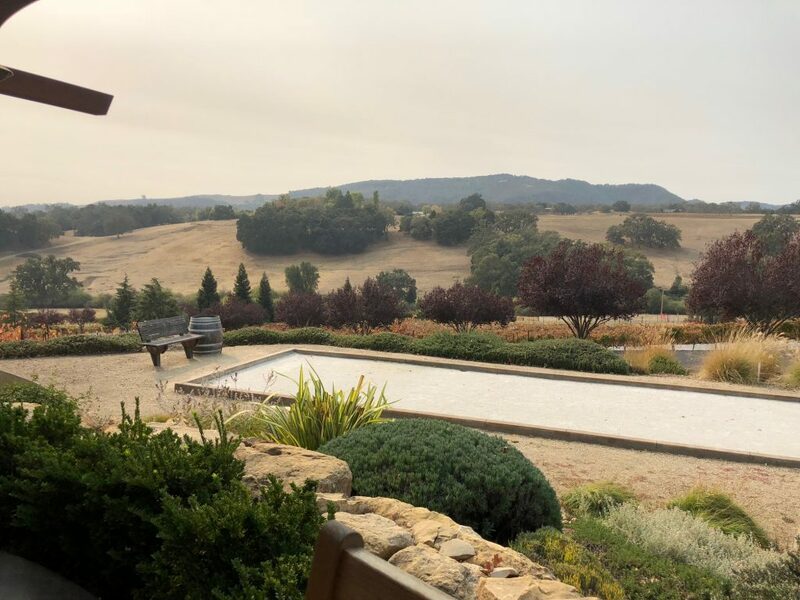 Sitting with Guillaume on the estate’s patio, as the rain stopped and the sky cleared, looking out over the property and sampling the current tasting room offerings, we got a chance to reflect on the last nine years and the plans for the future. As it turns out, everything has been in a state of evolution. That Roussanne we tasted nine years ago? That was the first wine under the Clos Solene label and it has evolved over time into Hommage Blanc, a blend of 80% Roussanne and 20% Viognier. The Rose has evolved as well, as Guillaume has focused on using grapes grown specifically for the Rose as opposed to bleed-off from grapes to be used for red wines. And then there are the reds. Every year, Guillaume has been perfecting these blends as well. One after another, these wines prove that Clos Solene represents the best of Paso. Some, like Harmonie, are pure expressions of Rhone varieties. Others, like Fleur de Solene, show what an artist like Guillaume can do without the restrictions of his native France, blending Rhone and Bordeaux varieties into true masterpieces. Truthfully, we are fortunate to be able to taste a lot of really good wine on a regular basis, both as writers and as consumers. But, the quality of the Clos Solene wines is still the exception rather than the rule and it helps to remind us what drove us to this passion in the first place. The future is exciting as well. Guillaume has always sourced fruit from outstanding vineyards, such as James Berry and Glenrose. But now with the new property, he’ll be able to produce wines from his own estate, controlling the process from beginning to end. It will be just like back home, but better. Production will continue to be very limited with some slight growth in production. Guillaume and Solene are working harder than ever, now with three little mouths to feed in addition to their own. Karen and I joined the Clos Solene Wine Club to make sure we don’t wait four or five years for another visit. Do you have a favorite wine? A certain varietal you always go for? From a specific wine-producing area? 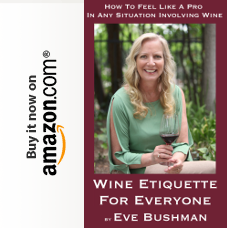 I don’t: I like to try everything and give every winemaker equal time on my palate. Last week it was Rhônes. For my wine 101ers this is a wine from the Rhone region of France, or, lucky for us all, Rhone varietals made here in the good old USA. The most common Rhône grapes include Syrah, Grenache, Mourvedre, Petite Sirah, Viognier, Roussanne and Marsanne (Learn more here from the group that has helped put U.S. Rhônes on the map, Rhone Rangers: http://www.rhonerangers.org/grapes). Anglim 2011 Syrah, 2012 “Cerise” Red Blend of Grenache, Syrah, Mourvedre (GSM) and a bit of Viognier and 2011 Mourvedre. Bonny Doon 2012 Grenache “Cuvee R” and 2009 Syrah Bien Nacido. 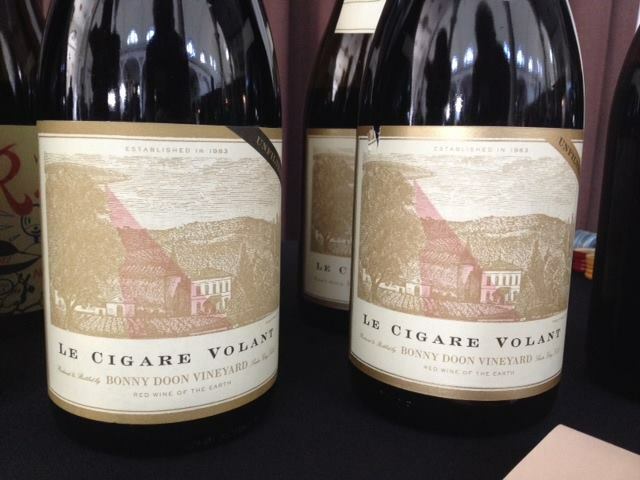 Donelan Wines full lineup: 2012 “Venus” White Blend made up predominantly of Roussane with some Viognier, 2012 “Cuvee Christine” Syrah that was just released at the tasting, 2012 “Cuvee Moriah” Red GSM Blend, 2011 Obsidian Vineyard Syrah and a 2012 Pinot Noir that was hiding out on the table, as it’s not a Rhône grape! Ecluse Wines 2010 “Prelude” White Blend of Viognier, Roussanne and Grenache Blanc. Law Estate Wines had all their outstanding new releases. Three red blends: 2011 “Audacious”, 2011 “Beguiling” and 2011 “Sagacious.” The 2011 “Beguiling” Syrah was also very noteworthy. Minassian-Young Vineyards 2012 Mourvedre and a 2012 Red Blend of Mourvedre and Grenache was incredibly balanced. Tercero Wines 2013 “Verbiage” Blanc Blend of Grenache Blanc and Viognier, “Verbiage” GSM Red Blend and 2010 Grenache Larner Vineyard. Vina Robles 2013 Viognier Huerhuero Vineyard, 2013 Rose “Roseum” Huerhuero Vineyard and 2009 Syrah “Syree” blend of Syrah and Petite Sirah.